Would you castrate a dog without anesthetics, as is done to pigs and cows? No. But I just eat meat; I'm not causing any of this. Whether you kill someone or hire someone to kill someone, you're just as guilty. Just food for thought. He insisted on shaking my hand as we parted ways. Moral of the story: When people say dumb things, we should just take it in the spirit that it is offered. On another note: Matt Ball's "How Vegan Is Enough" lecture at the Animal Rights Conference was refreshing. I almost didn't go because I was afraid the answer would be that there was no limit to how vegan one should be, that it might be some fire and brimstone speech with someone reciting the entire encyclopedia of animal products. Many people hear about all of these trace animal products and think veganism is beyond impossible. My free-range / organic ovo-lacto wife absolutely loves Vegan Outreach, because of your focus on preventing suffering and non-obsession with trace animal products. It's making her journey much easier. I remember when one person asked Matt how he could convince his brother to go vegan -- he'd been at it for years and years to no avail and basically felt like a failure. If he couldn't convert his own brother, he thought, how could he affect anyone else? Matt told him to forget about his brother, that his brother wouldn't turn vegan to spite him, if for no other reason. Matt told him to go to a college campus, a concert, a record store, and hand out literature: "Some of them will read it, become vegetarian or vegan, and you will have saved thousands of lives." I took great comfort in that remark -- it was as if a huge burden was suddenly lifted from my shoulders. With Brian Grupe and Jack Norris. I remembered that talk earlier today. 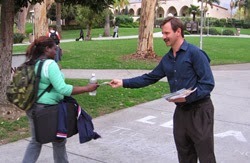 I was very tired and my back hurt, but I was able to distribute 750 VO booklets at Pasadena City College. On the drive home I started thinking about an old riddle: How many physicists does it take to change a light bulb?